Legal experts had said Ventura had to clear a high legal bar to win, since as a public figure he had to prove "actual malice." According to the jury instructions, Ventura had to prove with "clear and convincing evidence" that Kyle either knew or believed what he wrote was untrue, or that he harbored serious doubts about its truth. The jury told the judge Monday that it didn't believe it could reach a unanimous verdict, but the judge instructed them to continue. On Tuesday, attorneys for both sides agreed that the verdict did not need to be unanimous and would allow a verdict if only eight of 10 jurors agreed. After finding in favor of Ventura, the jury was also tasked with awarding damages for any harm to his reputation, humiliation and embarrassment. Jurors had to find that Ventura suffered an economic loss as a direct result of Kyle's statements, or that Kyle used Ventura to profit unjustly. Neither Ventura nor Chris Kyle's widow, Taya Kyle, were in the courtroom for the verdict. Chris Kyle was slain at a Texas gun range last year, so his widow is executor of his estate with control over proceeds from book royalties and movie rights. WCCO reports that Ventura's family bought a round of pizza for the media who were gathered outside the courtroom. In his closing argument, Ventura attorney David Bradley Olsen said he believes Kyle's estate has earned more than $6 million from the book, and suggested that $5 million to $15 million would be reasonable compensation for what he said was irreparable harm to Ventura's reputation. "The verdict will tell the world Chris Kyle's story was a lie," Olsen said. Olsen said Kyle's claims that Ventura said he hated America, thought the U.S. military was killing innocent civilians in Iraq and that the SEALs "deserve to lose a few" had made him a pariah in the community that mattered most to him - the brotherhood of current and former SEALs. "One-point-five million people have bought the book," he said. "Millions more heard Fox TV trash Jesse Ventura because of it. And the story went viral on the Internet and will be there forever." Defense attorney John Borger had told jurors in his own closing argument that the 11 witnesses presented by the defense "tell a compelling and consistent story" that backed Kyle's version. U.S. District Judge Richard Kyle, who is not related to the author, told jurors they weren't charged with determining whether Ventura was punched, but rather whether he was defamed by the remarks Kyle attributed to him. Chris Kyle, regarded as the deadliest military sniper in U.S. history, included a brief account in his book of a confrontation at a bar in Coronado, California, with a man he called "Scruff Face." In promotional interviews, Kyle identified the man as Ventura, a former SEAL who became a pro wrestler and movie actor before being elected for one term as Minnesota governor in 1998. Ventura was in Coronado for a SEAL reunion and graduation ceremony. Olsen said inconsistencies in testimony from defense witnesses about what happened the night of Oct. 12, 2006, were so serious that their stories couldn't be trusted. He also pointed out that people who were with Ventura that night testified that the alleged confrontation never happened. And he said Ventura would never have said any of the remarks attributed to him because he remains proud of his and his parents' military service. "The statement is completely out of character for Jesse Ventura. He never said anything like that in his life, and he never will," he said. 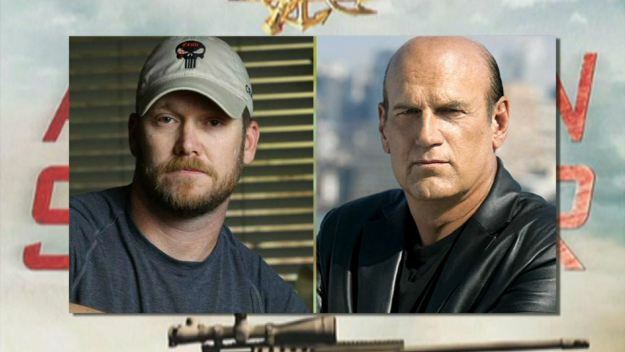 Ventura testified that his income as a television personality fell sharply as job offers dried up in the wake of "American Sniper." Borger said Ventura's career as an entertainer was in decline well before that.